Author Charles Peter Mason explains in a single sentence how he is “pushing condensation of expression and economy of space to their utmost limits” in the preface to his fourth edition of A Shorter English Grammar with Copious and Carefully Graduated Exercises (Toronto & Winnipeg: Gage and Company, c. 1879). Professor Mason, a fellow of University College in London, was also the author of several other English grammars and a contributor to William Smith’s Dictionary of Greek and Roman Biography and Mythology (London: Walton & Murray, 1870). I’m very glad I never had to use this grammar book in school. 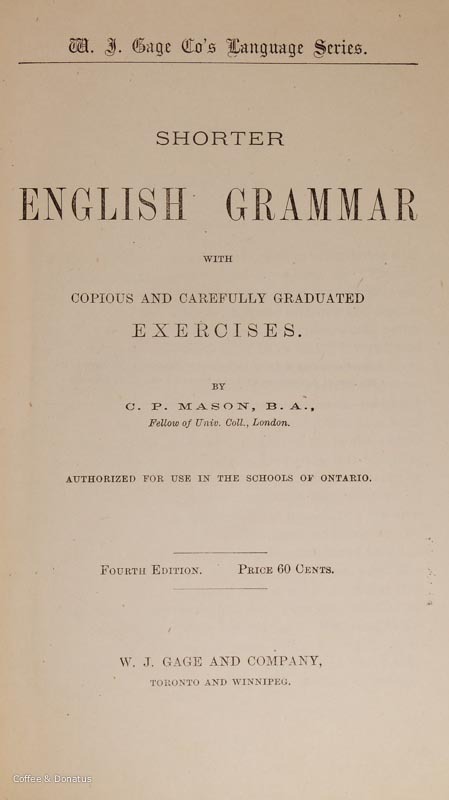 Title page from Charles Peter Mason’s “A Shorter English Grammar with Copious and Carefully Graduated Exercises” (Toronto & Winnipeg: Gage and Company, 1879). A shorter English grammar with copious and carefully graduated exercises. Toronto & Winnipeg: Gage and Company; London: Pardon and Sons, Printers, c. 1879.
, vi-xii, 253,  p.; 19 cm. Fourth edition.